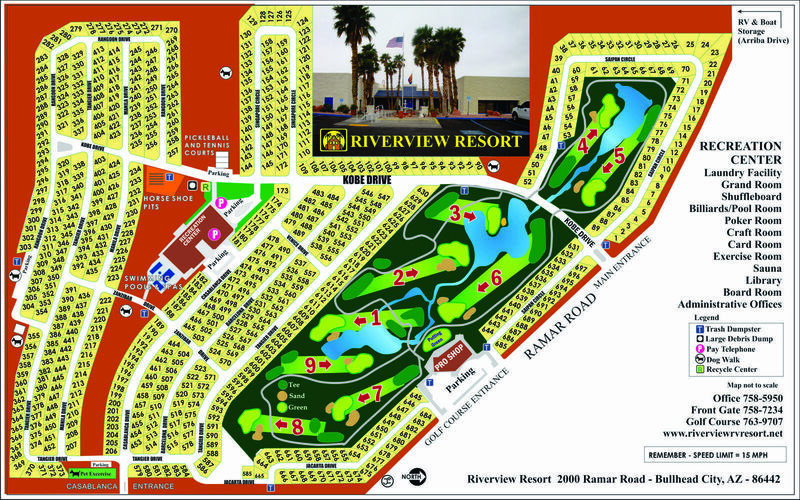 One of the best kept secrets in Arizona, the Riverview Resort is a beautiful, palm treed oasis, nestled between two mountain ranges across the Colorado River from Laughlin, Nevada in Bullhead City, Arizona. Residents own their own lots with some of the best amenities of a 55+ resort in Arizona. A gated Community with 697 lots with full hook-ups for RVs and Park Model homes. Long term rentals are available. Our property is surrounded by amazing views of the nearby mountain ranges or Colorado River below. Our 9 hole golf course weaves it’s way throughout the property adding great greenery and shady palm trees. Here are just a few of our community shared pictures. Very excited to have a place where the winters are beautiful and there are many acitivities here including golf and tennis that fits our active lives. A hidden gem in the high desert. We love snowbirding here and escaping the snow and cold weather of the midwest that we moved from. and the happy and always helpful staff. We look forward to answering any questions you may have regarding our great resort. Please feel free to give us a call at (928) 758-5950, send an email to admin@riverviewrvresort.net or use the contact form.